The Girls are 4 Months! 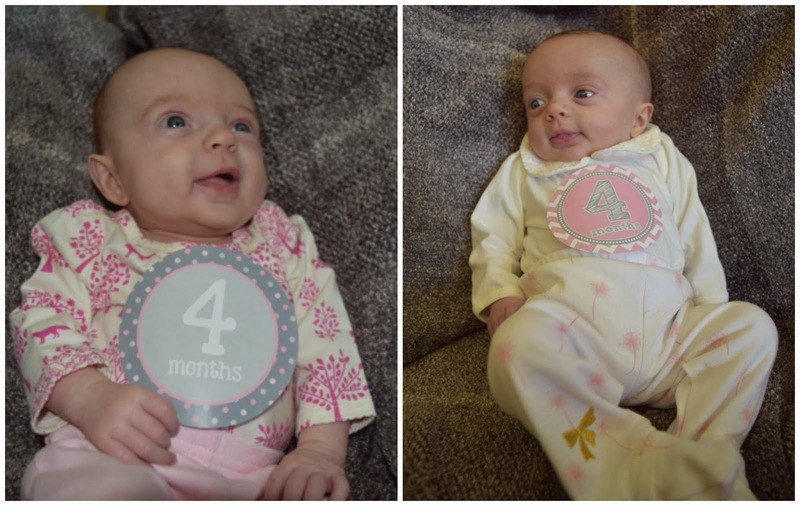 I can't believe it...my precious baby girls are 4 months old (as of yesterday). Time really does fly. It feels like we just brought them home from the NICU. They have changed so much in the last month, heck the last week. I fall in love with my babies more and more everyday and I now understand when people say you love them more and more each day. weight: The girls have their 4 month appointments come this Monday, so we will see at that time. 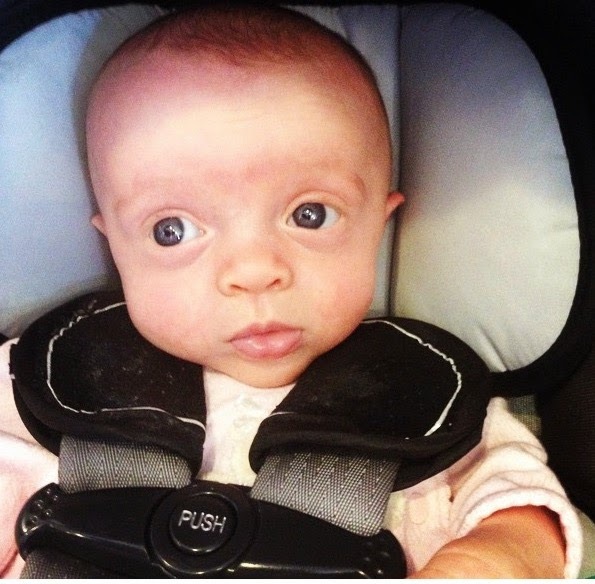 But we do know Sutton weighed 9 pounds 11 ounces on Tuesday because Little Miss got pink eye. First week at daycare and she gets a cold followed by pink eye. My poor baby girl. Plus grandma got pink eye from giving Sutte so many kisses on Saturday. Avery I am sure weighs over 10 pounds. They both finally have some chunk on their legs and getting those precious chubby cheeks. sleep: They were both doing so well until Sutton got sick. Then Sutton didn't want to sleep that much and kept waking Avery up. But last night they both did an amazing job and slept from 9 pm to 4:15 am in their cribs. I call that a win. And after that they slept a little longer just in our room. Keep this up babies! eats: The girls are eating machines. Don't mess with their feeding times or they get cranky. They take after their dad in that manner. Last month the girls were eating 85 (S) to 90 (A) mils per feeding and now Sutton takes down 115 mls and Avery takes down 120 mls. loves: They still love their new Wubba Nubs. And so does mommy and daddy. They love kicking their feet, sitting in their bumbo, playing in their jumper and their new kick n play bouncer. The girls are constantly moving and I hope they roll over soon. They really love their milk, snuggles, smiling, cooing, making faces, hands, standing up, sitting and looking at everything. dislikes: Bath time has been harder on them lately. We switched back to their tub in the sink, but I think they enjoy baths more when I get in there with them. That way they have some skin to skin time and stay warm in the water. They hate when we don't feed them on time. Mega meltdowns can ensue. They also hate being sick. It is the hardest thing to watch your babies be sick, cry and not be able to do much for them. Breaks my heart. So happy they are both getting better. The girls are smiling all the time and talking up a storm. They can't get enough coos in which melts mommy and daddys heart. Now only if we get can them to say mamamama or dadadada. They recognize us when we pick them up at daycare now. They get really excited and kick their legs. So cute. They are grabbing everything they can. Mostly mommy's hair and clothes with a death grib. Tummy time has become a favorite and usually will calm them down now. Their neck strength is awesome and they are almost rolling over. So happy their teacher at daycare encourages them to do these things. The girls got amber necklaces this weekend because they may be teething soon. They are drooling up a storm and have some whitness on their gums. I think the girls might be ready for some real foods (rice and maybe some veggies). They say if their are mouthing and imitating you while you eat, they may be ready. My girls have been doing this for a few weeks now, but we want to wait to ask the pediatrician what she thinks. The girls are constantly eating their hands, grabbing their feet an looking around. When they get super excited, they arch their backs and move around a ton. I can't wait to see what this next month holds for my sweet girls. 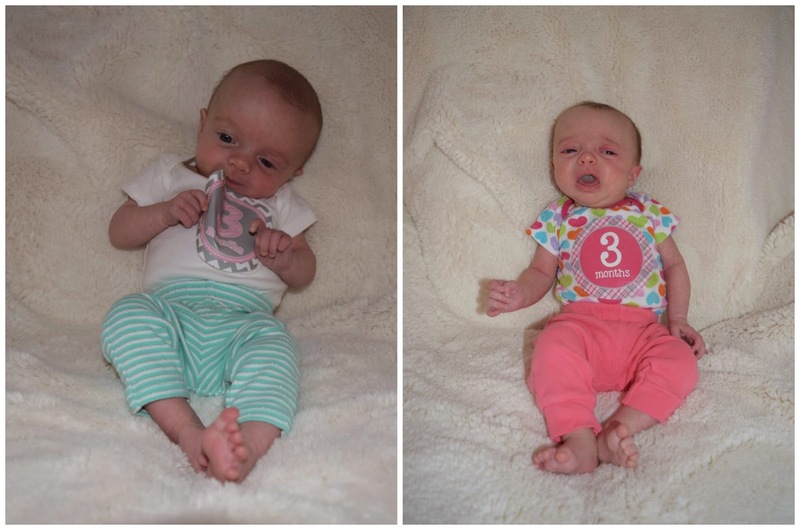 Mommy's sweet girls finally fit in their 0 to 3 month and 3 month clothing! I am finally gathering all the girls newborn clothes (which have been washed), so I can take them down to the NICU at Renown. People were super generous to our girls and we want to give back too. So we are donating all their clothes there, hopefully this weekend. This week seemed to drag. But that is probably because it was my first week back to work and away from my precious babies. But I made it through and each day gets easier. 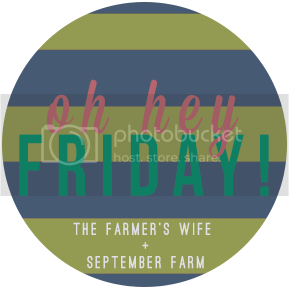 It's Friday and that means link up time with Karli from September Farm. I have no common theme to my five "things", so I am going with my five Friday randoms. One. I finally bought the girls baby books. I was hoping to get them for my shower, but we never did. Then I never found ones I really liked. There is one coming out that I do like, but it is on pre-order until September. The girls will be too old by then to really get all the memories down for those first 9 months. So I found one that I really love on my trusty favorite, Amazon. Two. I finally "mastered" pumping in public and at work. Look for a post to come on that soon along with one on pumping exclusively. Three. My babies. This week Avery learned all about the selfie since mommy made her take about 20 outtakes before she just had enough and decided to spit up on me. The girls have transitioned pretty well in daycare this week. Monday and part of Tuesday were pretty rough for them, but by Wednesday, they were loving it. They are the center of attention and everyone calls them so sweet. So glad they are acclimating well. Four. The Just Between Friends baby sale is in Reno this weekend and my mom and I plan to hit up the sale on Saturday morning. We are looking for 0 to 3 month clothes (specifically sleepers) cotton sleep sacks for the spring/summer and a bouncer chair. The girls seem to love the bouncer chair at daycare and we are always looking for things to put the girls in so they can play and watch us while we cook and do things around the house (whenever we get the chance to). Five. Grey's Anatomy. I haven't watched last night's episode yet, so please don't spoil it. But I did see glimpses on people's instagrams and facebooks saying they were really unhappy with the episode. I am so anxious to watch it and see what the fuss is all about. But I am also afraid that I too will be this unhappy. Anyone like the episode? Should I have a big box of tissues? Or something to throw at my tv? Guess I will watch it this afternoon while the babies sleep (because I only work half days on Fridays!). Happy Weekend All! Looks like mine is full of rain, so that means lots of baby cuddles in my future. So many blogs. I fell so far behind on keeping up with my favorite bloggers while on maternity leave that I think it will take me weeks to get myself caught back up. I also am reading up on baby sleeping schedules for 4 month olds. Nothing at the moment, but when we are at home and the girls are in bed, we have been watching Secrets and Lies. So in love with this show. I get so excited when an episode pops up in our dvr. Also we are finally getting around to watching House of Cards. I am so far behind which is crazy as I watched the last two seasons in a day or two. I was with my babies right now. They are so close (across the street) but so far away. Mommy misses them so much. The weekend. My momma and I are brunching it up with the girls and then heading out to a massive kids sale (all new and gently used clothing). And the countdown is on to our annual Graeagle trip. This time the girls will be with us as last time they were brand new embryos in mommy's belly. And we thought there was only one, but we were blessed with two! How I am ever going to find a bikini top that will fit these huge milkers. I tried on a bikini top, pre-pregnancy one and it doesn't fit at all. And I went to my go-to Victoria Secret to see if they made cute bikini tops in my size...nope. Ugh. I might need to up the band to fit the tatas. Plus the bikini I really want, the Milly Bikini from Triangl, I am afraid it won't fit. Even the Small++ (fits d-dd cup bust) might be too small. Do I risk it and send it back if it doesn't fit? Our dvr box is about to crash. Well it has been about to crash for a month or so. It is agonizingly slow and we finally called AT&T for a new box which was great. But the frustrating part...instead of sending us a brand new box that has cloud features, they sent us one that is a month newer than the old one. May 2011 folks. So now we have to wait it out again and try to binge watch our shows on a dvr that barely works and hope we don't lose all of our saved shows. Boo. Spaghetti. Pasta. Sushi. You name it, I want it. Pumping means I am starving all the time and I don't have the luxury of a pantry or frig one room away from me. Thankfully, it seems I have cut the sweets down to almost nothing since having these sweet babies. Delicious coffee. It is the only thing that keeps me going through the day. Waking up at 4:45 am to get ready, pump, feed the girls and get to work is exhausting. Well the day that I have dreaded for 16 weeks is finally here. The day I go back to work. The day I leave my babies at a daycare. The day I spend more than 2 1/2 hours away from them. Today is hard. But I know each passing day will get easier and the tears will be less each day, but in the meantime, I dream about being home with them again. The silver lining...I can go see them on breaks and lunch. Please oh please be lunch time already. We had a pretty good weekend other than the girls might be going through a growth spurt which means our babies are a bit fussy and taking down way more milk. My husband took Friday off work and we headed to Sacramento. This was huge for us since we have only been to our parents house with the girls for "big" outings. I bought a car battery charger for my pump on Thursday which was a huge life saver. I would recommend getting one. We headed to Vacaville for the outlets. First stop was Carters and Osh Kosh for the girls...even though we have them in Reno. We bought the girls a bunch of summery rompers and dresses. The girls finally fit in size 3 clothes and we need to stock up on more since they go through so many outfits a day (mostly due to drooling now). Then my husband and I proceeded to buy the place out. Ok not really, but we both did buy a lot which is weird considering we pay our first daycare bill this week ($1,456 per month...Ouch). In between shopping, I would pump in the car (or while we were driving) and we would feed the girls on the go. I think we all did a great job with this. We even changed a really poopy diaper on the tailgate of our truck. I think the day was a success. A long day, but a good day. Saturday we didn't do much since we had a big day Friday. But we did enjoy some breakfast at this crepe place. Yum. And I had about 6 cups of coffee that day. The girls grandparents came by to visit with them since they left to Mexico today. We are very jealous as we usually go there each year, but we have to wait it out until next year. Sunday we did some gardening. It felt really good to get outside and be in the sun. The girls enjoyed themselves too. Then we ended our day with massages. I loved it. Been far too long. The weekend flew by in an instant it seemed and I am on my final week of maternity leave. Boy will things be different after next weekend. Well my last week of maternity leave is here. It has gone by way to fast and in a short week, I will experience what my husband so many weeks ago did. I won't get to see my girls ALL DAY EVERYDAY. We made the choice to send our girls to daycare. I would love if a grandparent could watch them for us, but none of our parents are retired...YET. I tried to get my mom to retire, but sadly she still has about 7 years left. But we did our research, had advice from friends and decided to send our girls to the daycare across the street from our work. Super convenient yes, but we just like the place in general. There are only four children (infants) to one teacher and two of those babies are ours. It is a Christian based program, it is reasonably priced and comes highly rated. Now I just have to make it through my first day of work while they are there. But in the meantime, I am going to soak up every ounce of these babies and enjoy my week off with them. But going back to work also means I can blog more. I won't have my little ones to attend to and keep me from finishing my post (I have a few drafts in my folder). I also will get back the adult interaction everyday and get myself out of the house everyday. So I have to look at the good with the bad and transition into my new life. But look at these faces...how can one leave them? Our Easter weekend was pretty special this year since it was our first having our girls to celebrate with. I guess every holiday will feel this way, but this was the first we could do things for the girls. We got them dressed up, got them a small Easter basket and they met so many family members. It was definitely a great weekend. I am not really into doing the matchy outfits for the girls except for special occasions, and Easter was one of those. Check out my matching baby girls. The tights are a bit big, but they look so adorable in their outfits. I can't get over their cuteness. The girls received a bunch of Easter gifts from their grandparents, great grandma and cousins. They are spoiled and loving it! I can't wait for next years Easter so we can decorate eggs (maybe just my husband and I) and have the girls hunt for Easter eggs. Oh the cuteness that will be. And one more photo because Avery was just being too darn cute for the camera. Can you believe Easter is this weekend? I can't. And it's the first Easter for the girls. I am beyond excited. I am really looking forward to celebrating all the holidays with the girls. I am late on this train, but we are going to Target today to pick up some items for the girls Easter baskets. I am thinking books, stuffed animals, maybe new Wubba Nubs, an outfit or two and whatever else I can find. Hopefully I don't break the bank. I can't wait to show you all the girls Easter outfits. We bought them a few weeks ago and they are matching. I am not really into the matching outfits for identical twins other than holidays or special days. And Easter is one of them. So look out for that post Monday-ish. But today is Friday, and that means link up day. I haven't done one in weeks, so it's time to get back in the game. So here are my five randoms for Oh Hey Friday. One. Almost two weeks ago someone hit my car while I was in a coffee shop getting my husband and I coffees. I didn't even notice until I saw the note on my windshield. It didn't seem like much, but the estimate is over $1,000 to fix it. It needs some new paint, there is a dent, the door handle is messed up and sticks, some parts need to be replaced, etc. The sucky part is trying to do this with the girls. I took them to the estimate, but I won't be able to take them when I drop the car off because I have to get a rent a car and put their carseat bases in that thing. Way to hard to do with the babies there. Thankfully my mother-in-law is going to watch the girls. Love having family around! Two. The girls first Easter as I said above. I am really excited to start our own traditions for holidays. Plus next year the girls can go on Easter egg hunts. 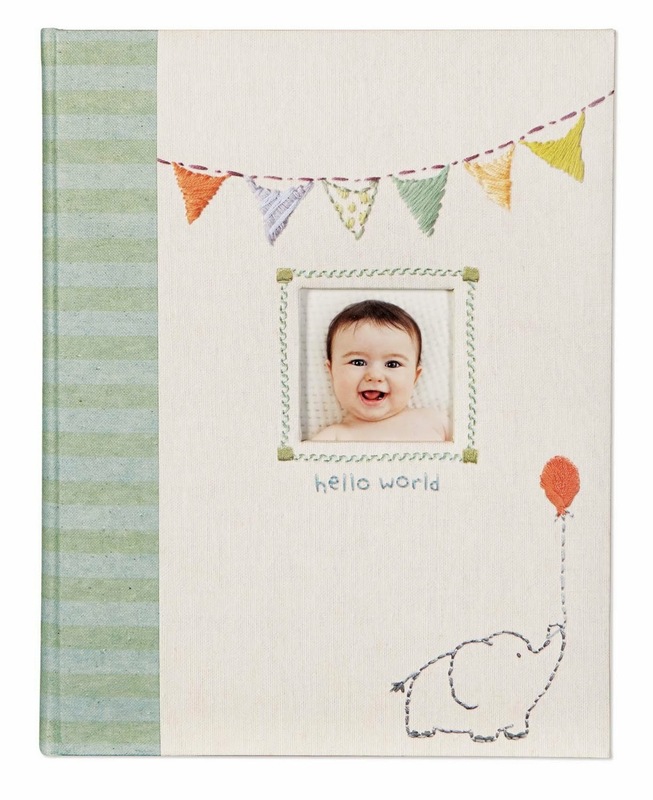 Oh the cuteness that will be! Three. 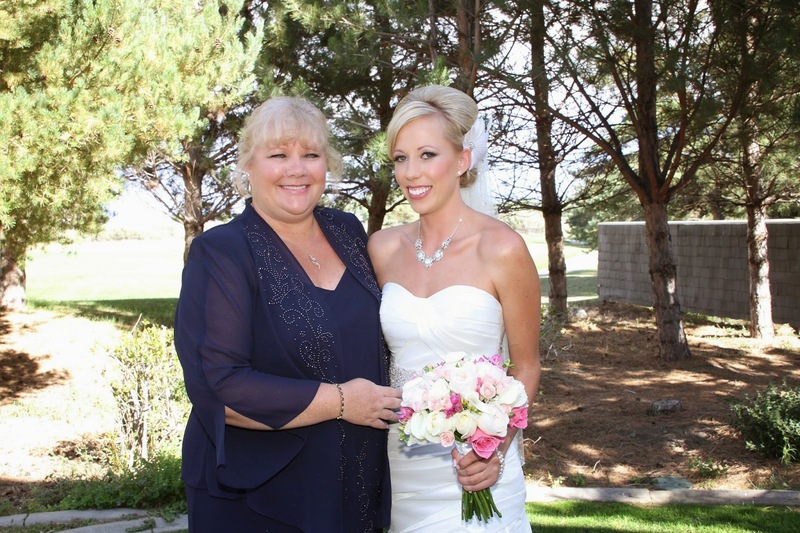 It is my moms birthday this weekend (Saturday to be exact) and I wanted to wish her a very Happy Birthday! She is going to be...Oh don't worry I won't tell. But I will tell you this, she is a young grandma since she had me at 19. Four. Getting eyelash extensions. I have been on the fence about getting extensions again (I had them for my wedding and a bit after) as it is costly, but I am so happy I got them. Not only will it make my life easier getting ready in the mornings (which is great since I have twins and not as much time as I used to), but I can wear less make up and still have that wow factor. I went to see Jess at Maza Salon in Reno, and I can't recommend her enough. And not just because she is my friend. She is awesome at what she does. She mixes the eyelash lengths and curls to get a more realistic look but still have that wow factor. Go see Jess if you are in the Reno/Tahoe area. Five. My girls, my husband and my pup. I am so thankful to have such a full and happy life. My husband's birthday was last week (Monday March 23rd) and he is still the most handsome man I have ever laid my eyes upon. He is my rock, my love, my life and my support. Plus he gave me the cutest twins EVER. I can't believe I only have 2 1/2 weeks left at home with my baby girls. The time has flown by in an instant it seems. Even those tough days flew by. I will be going back to work on April 20th and I am having mixed feelings about it. One moment I wish more than anything that I could be a stay at home mommy. And then the next I am ready to go back to work. I crave the adult interaction and some freedom (like going to the bathroom without babies screaming for me), but I will miss their sweet faces all day. I don't know how new mommies do it. I know this though, I will be at the daycare everyday that first week during lunch (the daycare is across the street from my work) to see them. I haven't been away from them for more than 2-3 hours at a time except my one night hospital stay, and that was really HARD. 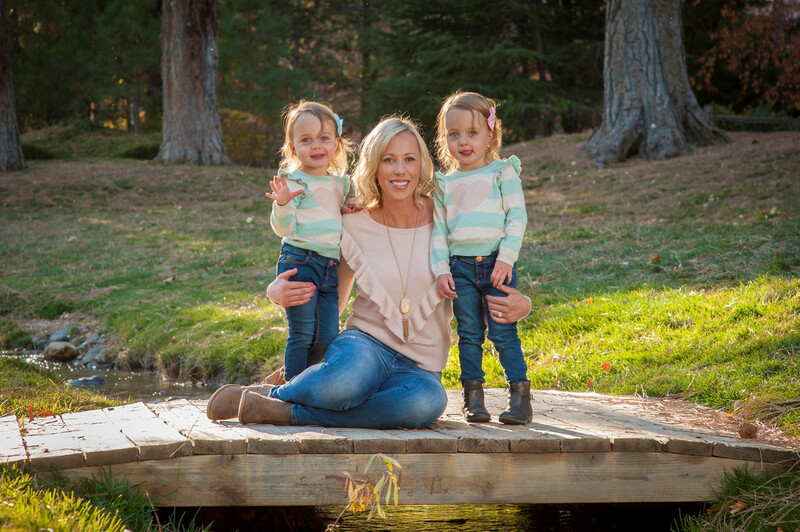 How do moms cope with going back to work and not being with their babies? Did you pumping/supply go down when you went back to work? Any tips or tricks to keep your supply up? Also, the list of things the girls need for daycare is insane, but reasonable I guess. But times that by two? Ouch. Two more sets of sheets, boxes of diapers, more bottles, wipes in a hard case, Aquaphor, pacis, milk, blanket (if wanted), 2 to 3 changes of clothes per baby and sunscreen (for summer outtings). Hopefully they give us report cards for the babies and keep us posted on their schedule. I am hoping the girls get a better schedule for napping down. Right now they sort of nap opposites of each other except the later afternoon nap. Any ideas or suggestions on how to make transitioning back to work and daycare easier for mommy and babies? It's that time again...3 month baby update. Can you believe my babies are 3 months already (just a few days over as I can't seem to get their post up on time)? Where has the time gone? 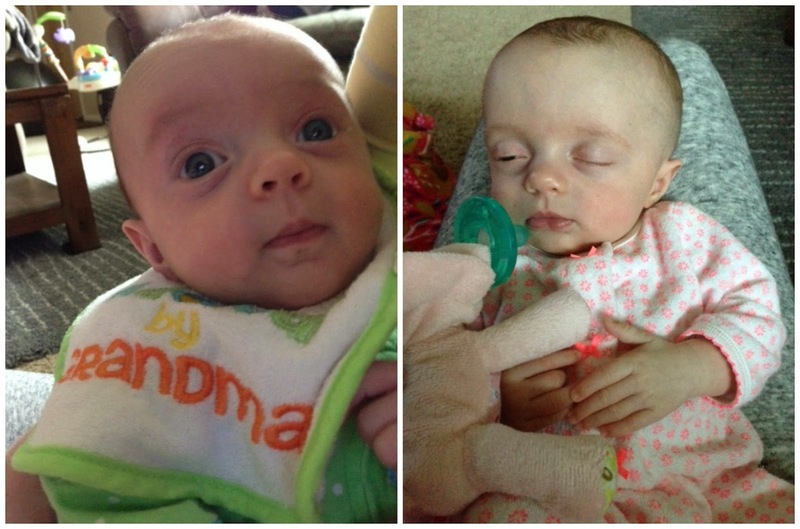 weight: Well the last time the girls were weighed was March 26th and Avery weighed 8 pounds 6 oz and Sutton weighed 8 pounds. And the girls are gaining at a steady half ounce to ounce per day, so I am guessing Avery is closer to 9 pounds and Sutton is closer to 8 1/2 pounds. Finally bigger than newborn size! That means we can start wearing the 0 to 3 month size, which means a bigger variety of clothes. 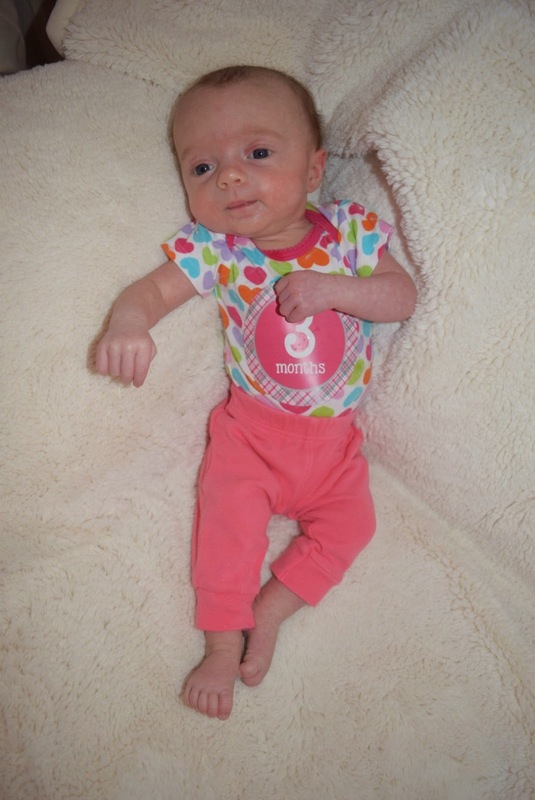 You may notice in the pictures ahead that Sutton is in the same pants as her 2 month photos. Fashion Fail on my part. Oh well. sleep: The girls are doing better and better by the day. We put them down sometime between 8:30 and 9 pm and they sleep until their 11:30 pm feeding. Then they sleep again until their 5 am feeding. Hopefully we can kick the 11:30 pm feeding if they can start handling more mils per day time feedings. Fingers crossed. I hope to have that 11:30 pm feeding gone by the time I go back to work in 3 weeks. Any suggestions on how to get them ready? eats: The girls love their milk and love it every 3 hours during the day. Don't mess with their schedule otherwise you will have screaming babies. The girls are currently eating 85 to 90 mils per feeding and chowing it down fast. We hope to move up to 90 to 95 mils soon. The girls act like they still are hungry, but we are battling a bit of spit up after some daytime feedings. Is this normal? It is only minor amounts. Are we safe to up them a bit? loves: They love their new Wubba Nubs. And so does mommy and daddy. They keep their pacis in better now since we can prop them in and put the animal in the blanket to help. 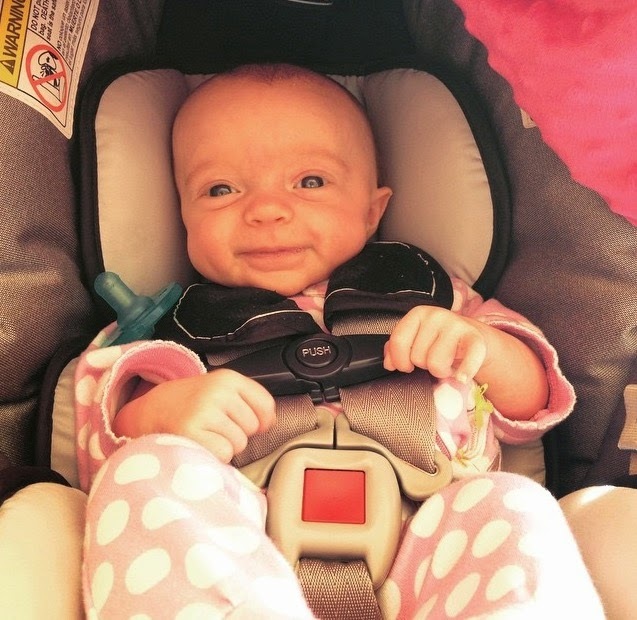 They love their milk, cuddling, smiling, hands, sitting up, mommy and daddy, their carseats and going out (to dinner, shopping, whatever it is they love being on the move). dislikes: I would say bath time is still a love hate because one bath they love it and the next they cry some of it. They also hate being naked, diaper changes, when mommy leaves their sight and when they lose their pacis. My girls have changed so much in such a short time. It seems like one day they were just learning to smile and now they smile all the time. They have also found their hands and love putting them in their mouths and grabbing everything in sight including mommy's hair, necklaces, toys, their pacis, blankets, etc. The girls have started cooing and talking thanks to mommy's crazy sounds she makes at them. Whatever it takes to get them to talk, right? The girls are gaining so much neck strength that it is hard to keep their heads down for burping sessions. They would rather look around at everything. The good news is, they are almost rolling over. It is so much fun to see the changes from week to week. I am going to miss it when they go to daycare. I hate the thought of not being with the girls all day, everyday, but this will be good for all of us (or at least I keep telling myself this). Advice on how to transition from home life to daycare life?